Arnold Palmer. I remember the first time I saw him play. In the 1977 Houston Open I was following my hero. In a crowd of hundreds of people, I would have sworn he made eye contact with me on every hole. He had that kind of charisma. Sometime today mix up an “Arnold Palmer” and toast a man who knew how to win with class. Cheers! What you do with your life will be your legacy. No one requires you to win with class. It is something you do to help someone along the way, to support your colleagues, your friends, and those whom you may not know. It is a gift that comes without a price tag. Your legacy is priceless. In some cases, you may never know how much you impact the success of others. Not too long ago, while touring Boston, I passed a cemetery where Ephraim Wales Bull was buried. I had never heard of Ephraim Wales Bull, but the tour guide said he was the person who created Concord grapes. However, he never profited from the grapes because he died before they were marketed in jellies and jams. The reason I share the story of Ephraim Wales Bull is because the epitaph on his gravestone reads, “He Sowed, Others Reaped.” I think that should be our mission as leaders—to keep sowing and allow others to reap. That is what leadership is all about. 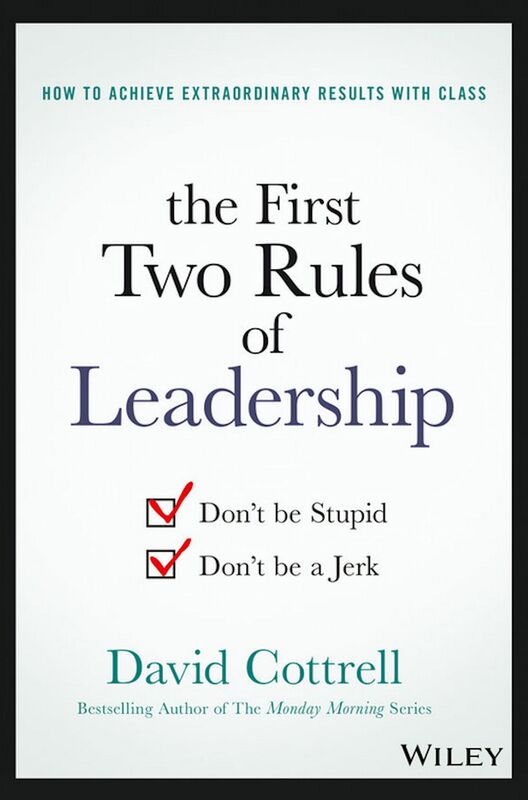 If you want to achieve extraordinary results with class, read and apply The First Two Rules of Leadership: Don’t be Stupid. Don’t Be a Jerk. It will help improve morale, decrease turnover, increase everyone’s job satisfaction, and you will have a whole lot more fun leading. The joy of leadership is in the gift of knowledge that you give, not in what you receive in return. The purpose of giving is not to receive back in full measure. If you give solely with the expectation of receiving something in return, you are really not giving—you’re swapping. If you receive something in return of your gift, what you receive is a bonus—not a repayment of debt. There are people surrounding you today who could use your experience, advice, and counsel. Just look around . . . people are desperate for help and do not know where to go or who to turn to. You have the experience to make a profound difference in their life just by sharing your knowledge. The average person has great intentions of making a difference. Intentions do not accomplish anything. The people who find success make the conscious decision to step out and make a difference. I hope you will make that decision.